Discover a one-dish bacon and vegetables medley bursting with flavor. 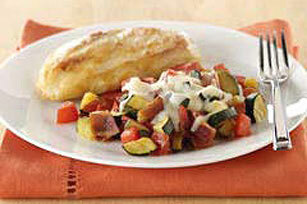 This Sizzling Bacon and Vegetables recipe features a fantastic Italian dressing. Cook zucchini, tomatoes and bacon in dressing in skillet on medium-high heat 6 to 8 min. or until zucchini is crisp-tender and bacon is done, stirring occasionally. Substitute 1-1/2 cups sliced fresh mushrooms or coarsely chopped fresh green beans for the zucchini. Makes 2 servings, 3/4 cup each.